The United States entered World War II in December 1941, after the bombing of Pearl Harbor by the Japanese. With Japan now considered an enemy state, part of the U.S. response in 1942 was to order more than 110,000 people of Japanese ancestry living on the west coast and in Hawaii into forced interment in remote camps operated by the military. The internees were men, women, and children; immigrants and U.S.-born citizens. They were considered a risk to national security, and their removal from society was widely (but not universally) viewed as a justifiable precautionary measure. Executive Order 9066 was issued and signed by President Franklin D. Roosevelt in February 1942. This order authorized the Secretary of War to build and operate military installations where Japanese Americans, German Americans, and Italian Americans would be imprisoned for the duration of the war. The order doesn't specify which Americans would be interned, but uses the term 'alien enemies'; given that at the time the U.S. was at war with Japan, Germany, and Italy, it doesn't take much imagination to figure out who the intended prisoners would be. Interestingly, or perhaps not, only Americans of Japanese descent were interned in large camps. A total of about 14,000 people of German or Italian descent were interned. Of the Japanese Americans interned, about 70% were U.S. citizens. Many more would have been, but for the fact that Japanese-born immigrants to the U.S. (Issei) were by law forbidden to take U.S. citizenship despite having no loyalty to Japan. Their American-born children (Nisei) were, of course, American citizens, eligible to be drafted into the military and fight for the country that had interned their families. Manzanar is one of the internment camps. Located in the eastern Sierra just off Highway 395 in the Owens Valley in southern California, it sits in a most glorious location. Even today it is hours away from any type of city, but definitely worth the drive to visit. I learned a lot at the visitor center, which is probably the best one I've ever been to. We were there for over three hours, learning about the lives of the people interned at Manzanar. The camp was surrounded by a barbed wire fence. Eight guard towers (built, ironically, by Japanese craftsmen) were manned by military police. The fencing and most of the guard towers are gone now. At some point after the camp was dismantled, most of the buildings were removed to other locations. There isn't much remaining on the site, but what is there is crammed full of information and artifacts from the people who lived there. 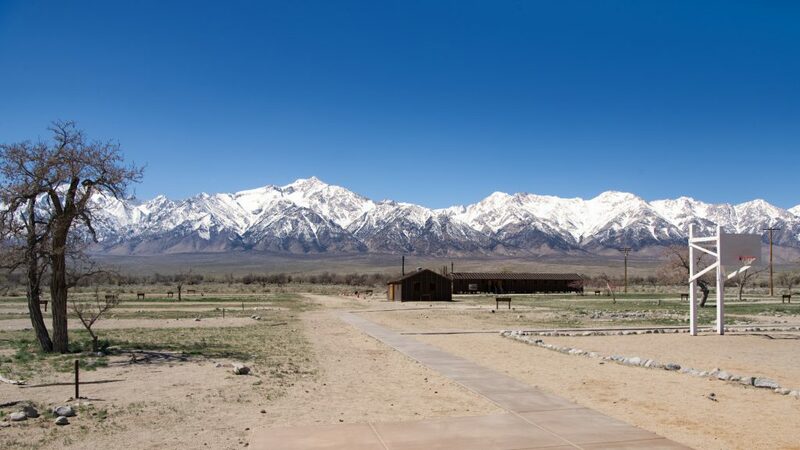 Manzanar housed ~10,000 internees, most from California and Washington, plus civilian and military families. Internees were stuffed into 504 barracks organized into 36 blocks. Each block, home to 200-400 internees, contained 14 barracks, a mess hall, men's and women's latrines, and a laundry room. There were also school buildings, a Buddhist temple and a Buddhist church, housing for military and civilian residents (built of much better quality than the barracks for internees, with indoor plumbing, solid walls, and insulation). Within the barracks there was no privacy. Seven or eight people, who could be family members or complete strangers, lived in a 20-by-25 foot room, or 'apartment'. 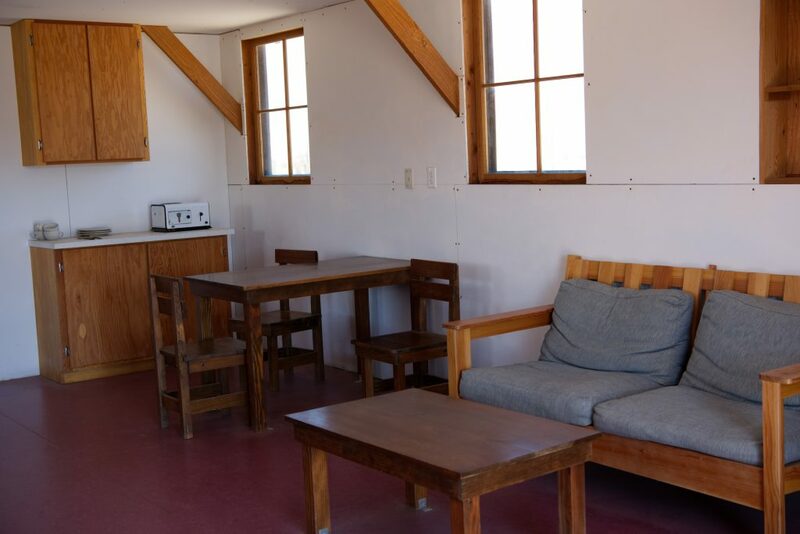 For each room, the government provided cots with straw mattresses, blankets, an oil stove for heat, and a single hanging light bulb. The restored exhibits in Block 14 are much better lit now than they were when people were interned here. 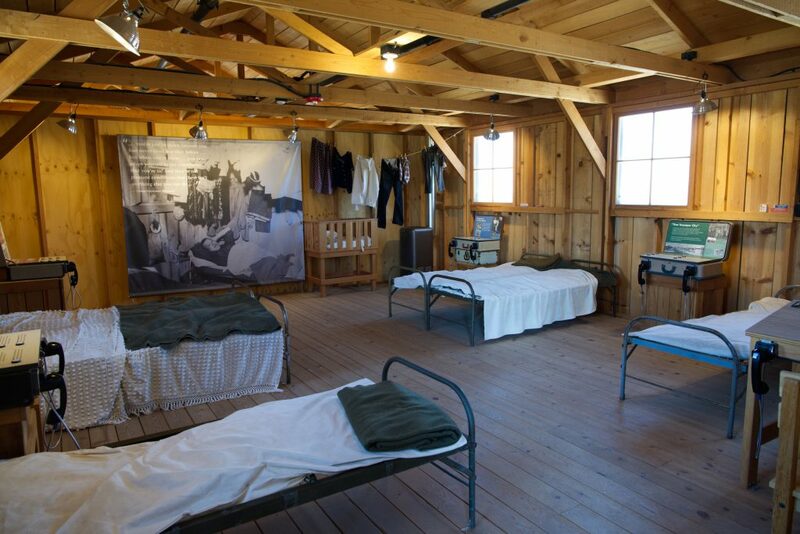 The internees would hang blankets or use personal belongings to contrive some semblance of privacy in a small room shared with strangers. 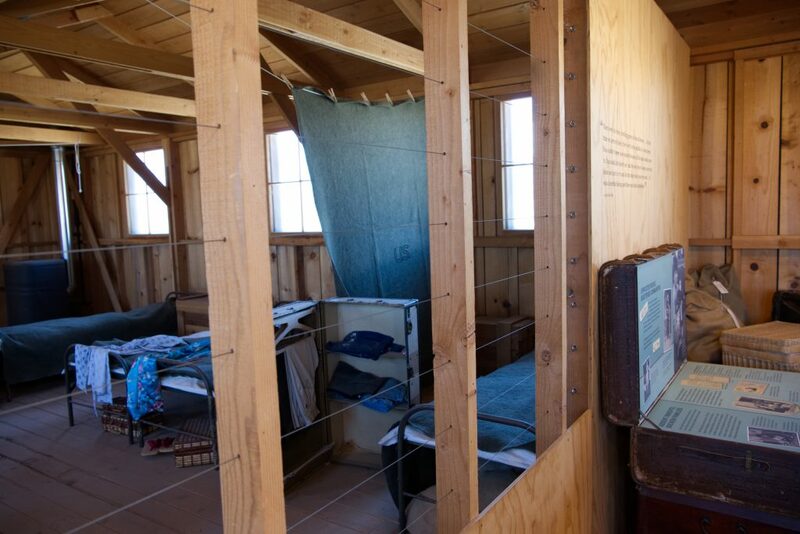 When internees began arriving at Manzanar, the barracks were built of wood covered with tar paper--no insulation or even sealant between the boards of the walls and floor. This construction was woefully inadequate for the frigid winters and blazing hot summers of the high desert, and provided no protection from the wind that blows year-round and the dust that it carries. Dust storms were very common, and internees would hunker down for the worst of the storm and then sweep out the dust. The barracks were eventually reinforced with real walls and some degree of insulation, but linoleum wasn't installed on the floors until late 1942. The internees were very resourceful people who did a remarkable job of making an extremely unpleasant situation as bearable as possible. Many were craftsmen, and they built furniture from whatever they could get their hands on. 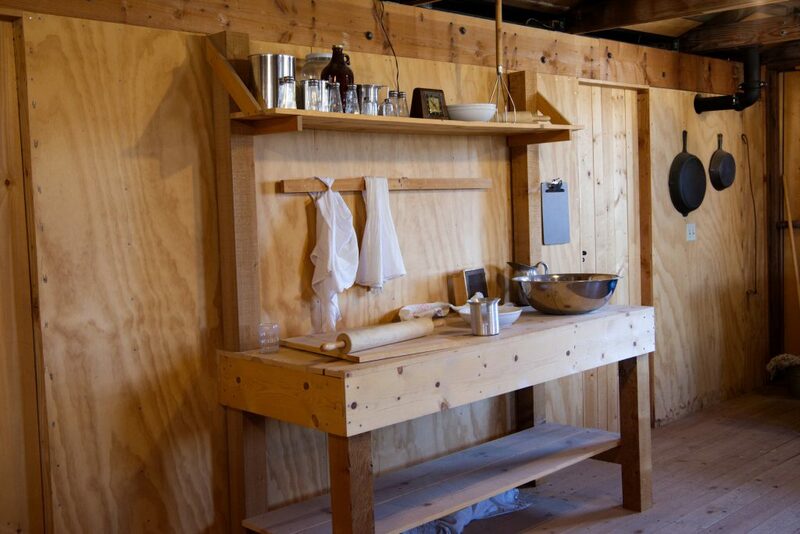 Fruit packing crates provided lumber that was built into tables, chairs, and cabinets. There's another bank of five toilets on the opposite side of the white partition. Imagine waiting in line with dozens of people, many suffering from diarrhea due to the unfamiliar diet and stress, for the chance to use a toilet with nine other strangers in such close proximity. 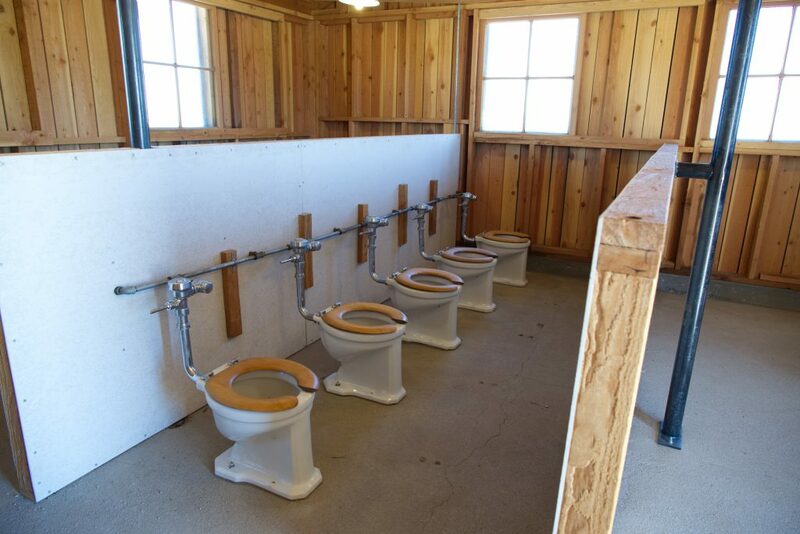 This lack of privacy in latrines was cited by many residents as one of the greatest hardships of life at Manzanar. Internees ate all of their meals in the block mess hall. At first internees would venture from block to block searching for the best chef in the camp, but eventually the authorities cracked down on such wandering and forced internees to eat in their own block. Meal prep began well before dawn and continued through the evening. Meal times were stringently scheduled throughout the day. 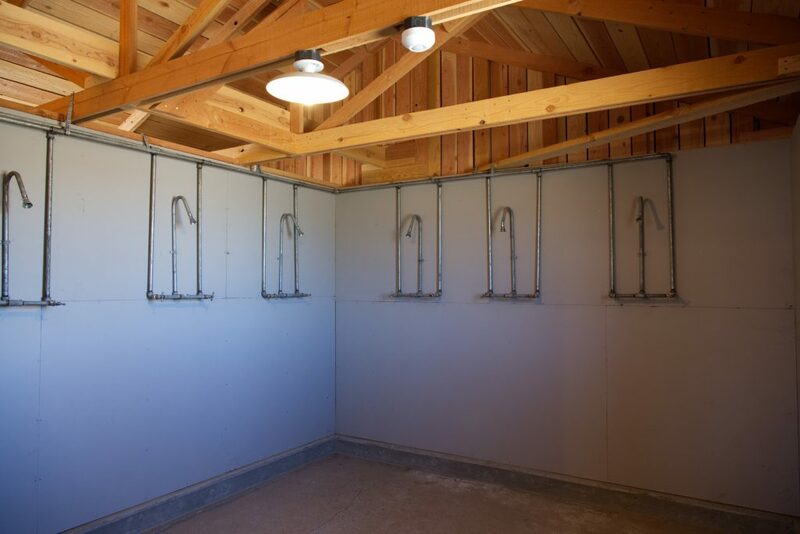 Kitchen scraps were used to feed hogs, and an on-site chicken ranch provided eggs. Eventually chefs were provided with the materials to make tofu and miso, which were used to make more palatable meals for the internees. 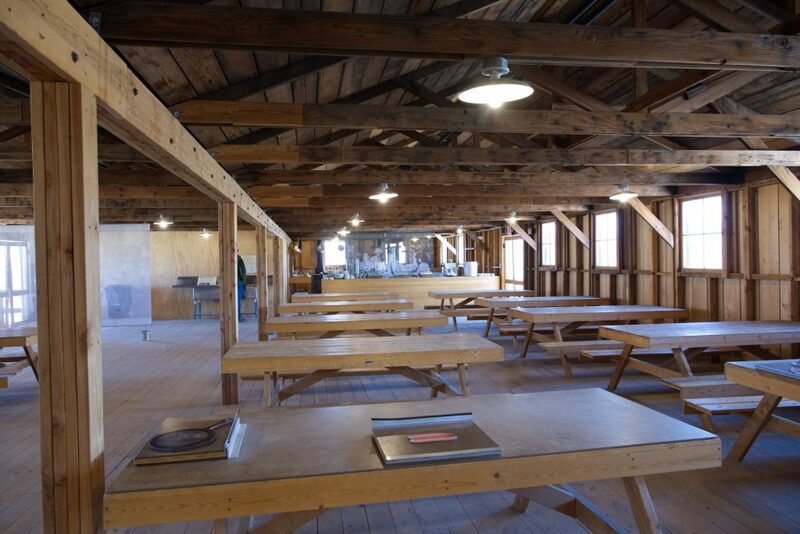 Mess halls also served as social areas and often hosted movies, dances, or meetings. Japanese craftsmanship is evident in the tools used by the chefs. 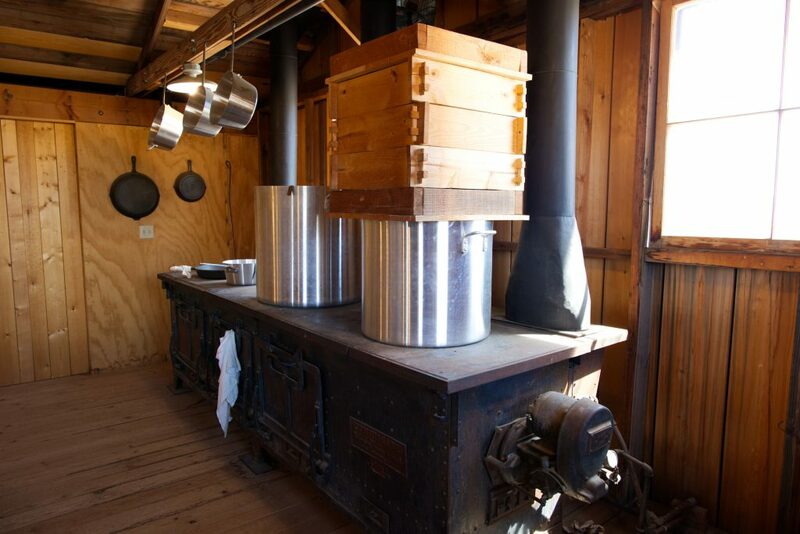 Internees built this baker's table, and also the massive steaming basket on the industrial stove. 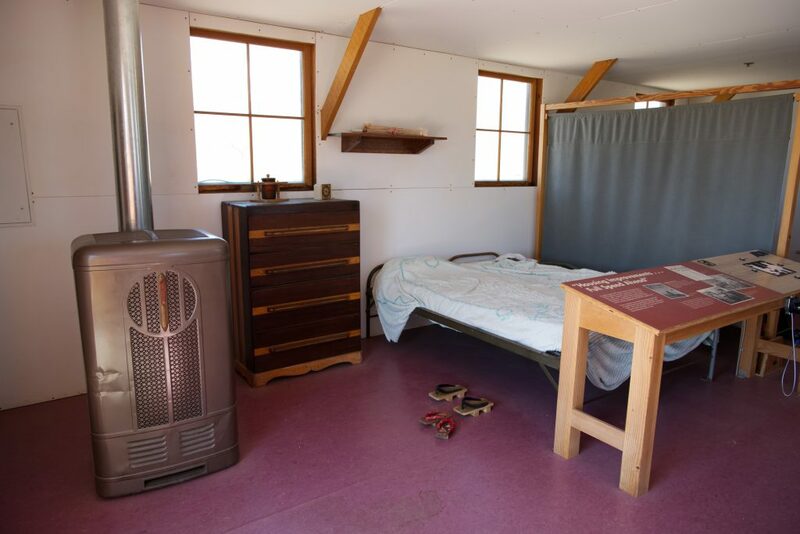 Exhibits at the Manzanar visitor center include recordings of internees recollecting their experiences in the camp. In many ways the internees tried and succeeded at making life as normal as possible. There were two schools, one for younger children and a high school. An on-site hospital was run by one of the woman internees who was a physician; she was extremely insistent on cleanliness throughout the camp and that all residents receive inoculations against disease. Couples were married and babies were born. Kids played the all-American games of baseball and basketball, even against other high schools that came to Manzanar. The Manzanar teams were never allowed to compete at other schools, though. The internees at Manzanar must have been fully aware of the irony of their situation. They were prisoners of the U.S. government, their property and businesses seized, their rights stripped away. The worst of the indignities, in my opinion, was the loyalty questionnaire. Its purpose was, ostensibly, to determine who were the 'loyal' Japanese Americans who could be safely released from the camp to states in the interior of the country. Questions 27 and 28 were especially problematic. They were worded slightly differently for men and women, but the overall gist is the same. Question 28: Will you swear unqualified allegiance to the United States of America and faithfully defend the United States from any and all attacks by foreign and domestic forces, and forswear any form of allegiance or disobedience to the Japanese Emperor, or any other foreign government, power, or organization? Question 27 was problematic because if a man answered 'yes', he could conceivably be drafted into duty and have to fight against his ancestral homeland, where he may still have family residing. Some men answered 'no' for this reason and were deemed disloyal as a result; they were segregated from their families and sent to even more strict camps. Question 28 was problematic for more subtle and insidious reasons. Many Nisei (American-born children of Japanese immigrants) were insulted by the implication that they had any loyalty to Japan or the Japanese Emperor. For Issei, who were denied U.S. citizenship, a 'yes' answer could leave them without a country. Recognizing the difficulty for Issei, the WRA (War Relocation Authority) did revise Question 28 to read as follows: Will you swear to abide by the laws of the United States and to take no action which would in anyway interfere with the war effort of the United States? 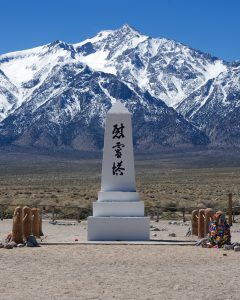 As a native Californian, I feel I should have known more about Manzanar and the role it played in our country's history. The gathering and imprisonment of Japanese Americans for no reason other than their Japanese-ness was misguided and, as it turns out, unnecessary. None of the Japanese American internees at Manzanar were ever found to have committed any act of treason, sabotage, or disloyalty towards the United States. I see similar attitudes in recent attempts to close our borders and separate immigrant children from their parents, and fear that those in power who most need to learn the lessons of Manzanar will choose to remain ignorant. The more things change, the more they stay the same. 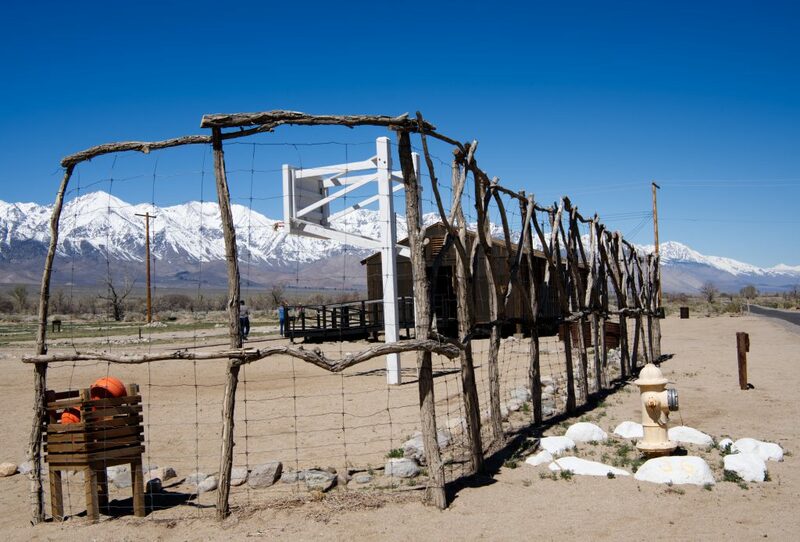 I leave you with this image of the basketball court at Manzanar. Kids shooting hoops in the afternoon sun--how much more American can you get? But that fence. It gives me the creeps. What does this image say to you? I've never understood how people can be so oblivious to the most obvious injustices. I wonder how many of the people who currently support this administration's immigration policies know anything at all about the Japanese internment and, if they do, if they've ever given it any thought at all. The problem in this situation is that people don't know much about the internment of Japanese Americans in WWII--certainly not enough to feel squicky about it or draw parallels to the current administration's actions. Visiting Manzanar did make me feel both ashamed to be an American and afraid that the same sort of treatment could happen to my family if the U.S. and China were to go to war.